In the autumn of 1914 the Most Rev. 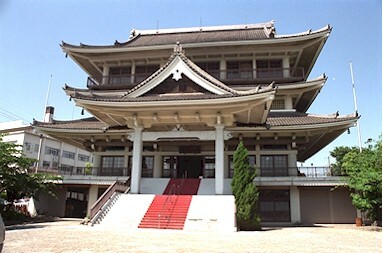 Tatsuko Sugiyama, the founder of Daijokyo, established Bukkyo-kanka-kyusaikai in Shimizu Town, now Higashi Ward of Nagoya. From that time on, she worked hard to put Buddhist Dharma into practice; she offered a helping hand to orphans, the poor and needy and people with disabilities, she volunteered to help Hansen’s disease patients by providing them with both spiritual (preaching) and medical care, and rushed to bring relief supplies to disaster-struck areas. After fulfilling her duty as a reincarnation of Supratisthitacaritra, the Most Rev. Sugiyama entered nirvana on June 28, 1932, after a life of 65 years. Following the founder's passing, the organization was renamed Bukkyo-jutoku-shuyodan, Daijo-shuyodan and Togo-shiseikai, and was led by the late Most Rev. Keiyo Kosakai (first president), followed by the late Most Rev. Hozan Sugisaki (second president). Without yielding to the suppression imposed by constituted authorities during the period of confusion caused by the Manchurian Incident and World War II, believers faithfully followed the founder's teachings and adhered to her will in their social and other activities. That led to the establishment of Daijo-kyokai in Tokyo in 1946, followed by the founding of “Daijokyo” religious corporation in Nagoya in 1948. It was then that the association made a fresh start, as a religious society, in practicing the Acts of Bodhisattvas as the founder had wished for many years; the association thus came to embrace the Eternal Shakyamuni Buddha and his four attendant Bodhisattvas (Visistacaritra, Anantacaritra, Visuddhacaritra and Supratisthitacaritra) as its principal images, and to rely upon the Lotus Sutra as the book of great truth preached by Buddha. Daijokyo is a society of lay Buddhists based on the truth of Lotus Sutra, but it does not belong to any particular denomination or sect. Daijokyo believers simply inherit the painstaking attitude of the founder, who adhered to the true meaning of the Lotus Sutra and sacrificed her life to its diffusion in mappo (the period of the last law or saddarma-vipralopa). Daijokyo applies to modern times the spiritual training of Buddhists through practice, and considers the Lotus Sutra to be a textbook of the Three Virtuous Practices — Jihi (Compassion or Dana), Makoto (Honesty or Sila) and Kannin (Patience or Ksanti) — that anyone can easily apply to everyday life. The essential code of conduct for Daijokyo believers inheres in the precepts of the Lotus Sutra as embodiments of the long-cherished ambition of Buddha. The code comprises: reflection and repentance in our practicing the Acts of Bodhisattvas; unceasing effort toward perfection of character; and devotion to social cleansing. The first headquarters building, established in 1953, was two stories high and made entirely of cypress. To accommodate the growth of Daijokyo, the building underwent full-scale renovation in 1968, acquiring the majestic aspect it presents today. The Main Hall enshrines the Eternal Shakyamuni Buddha and his four attendant Bodhisattvas, which are the main images of Daijokyo. These are the absolute principal images to be embraced by the entire world for the future. This pagoda was established to extol the goodness of Buddha, and to pray that all people throughout the world may return to the wonderful Dharma of Lotus Sutra and world peace may be realized. 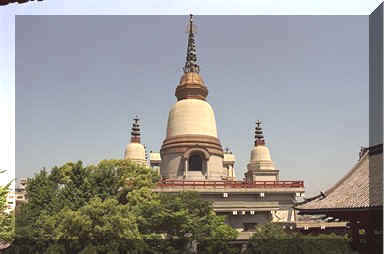 The 55-meter Peace Pagoda, soaring into the skies of Nagoya, keeps watch over human happiness. This Great Buddha Nirvana Statue, which is very close to being a national asset, was created in India about 300 years ago and was presented by the King of Burma to Japanese Emperor Taisho as a token of friendship. 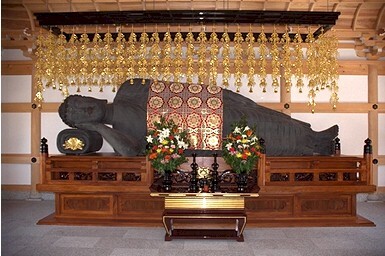 Measuring 5.6 meters in height, with soles as long as 66 centimeters, the Statue is said to be one of the biggest — and rarest — wooden nirvana statues in Japan. The Statue had long been enshrined in Yakushido Buddha Hall, an Important Cultural Property, of Mutsu Kokubunji Temple in Sendai City. However, on the occasion of Daijokyo's receipt of holy relics (real ashes of Buddha) from the government of India, the Statue was donated by Mutsu Kokubunji Temple to Daijokyo Headquarters. 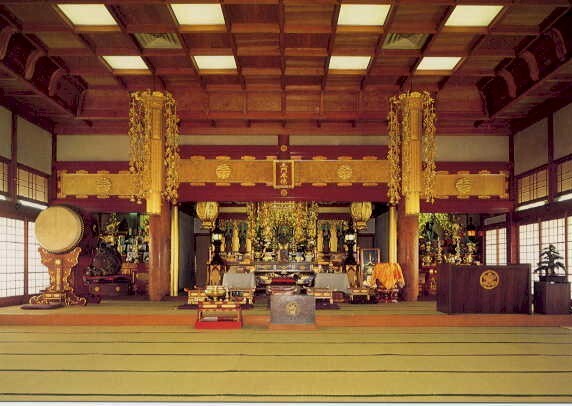 In 1995, 50 years after the war, Daijokyo established Nirvana Hall in prayer for lasting world peace. 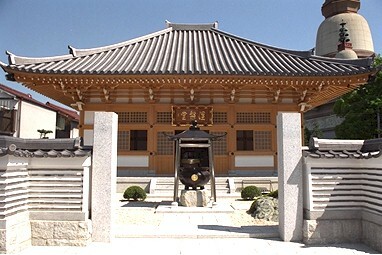 Daijokyo keeps the Hall open to the public, and works to restore and preserve the Nirvana Statue. In Buddhism, the white elephant is the symbol of charity and practice of the Lotus Sutra. This statue was established to commemorate the 60th anniversry of the founding of Daijokyo. Because of this statue, the temple of Daijokyo Headquarters is known among local people as "the elephant temple." The giant "Peace Bell" was cast in 1956, to commemorate the 2500th anniversary of Buddha's Mahaparinirvana. 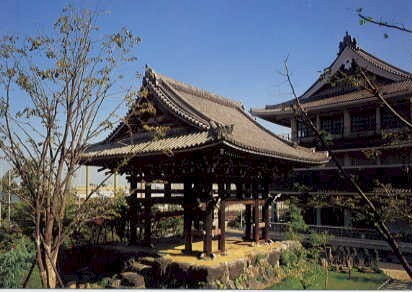 The Peace Bell is one of the best-known features of Nagoya, along with the gorgeous bell pavilion, built in the style of the Momoyama period (late 16th century).